Today we have a case on our test bench from a company I haven't heard of until recently, Sentey. They sent us a case from their Extreme Division. 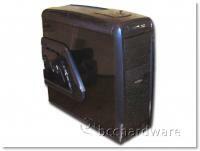 The Arvina GS-6400B Mid Tower case, the B stand for the color scheme which is mostly blue with some black. Sentey is a company that has focused their products on what gamers want and is based in South America. 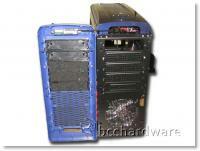 They manufacture products like cases, power supplies, coolers and video cards. 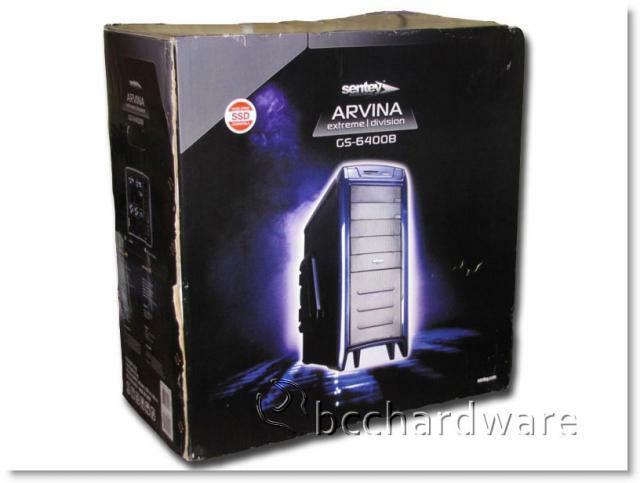 The Sentey Extreme Division Arvina GS-6400B Mid Tower case is packaged as you would expect. It is in you standard cardboard box surrounded by some Styrofoam, but it isn't wrapped in your standard plastic bag. It is in a cloth bag. Which is something new to me. I imagine the cloth bag does a better job of keeping the Arvina case from being scratched or damaged during its travels. Trust me it needed it. It was shipped through UPS which put their packaging to the test. As you can see from the pictures below. The first thing you notice after unpacking the Arvina is its high gloss paint, which shows every finger print. Then I noticed the built in card reader, a nice addition. The card reader does accept all kinds of media cards like: CF/MD, SD/MMC, XD and TF & MS/M2. Then I was draw to the slider on the top of case which revealed 4 x USB 2.0 ports, a reset button, a e-SATA port, a SATA port, a 3.5mm mic port, a 3.5mm headphone port and the HDD activity led. 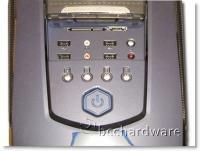 Next, just above the card reader is the main power switch and just behind the main power switch is a row of 4 fan on/off switches. The top of just behind the slider is all steel mess with filter foam. 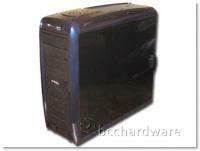 The front of the Sentey Arvina GS-6400B is covered in a steel mess with the exception of the top 2 optical drive bays. The top 2 optical drive bays have a cover that conceals your drives, nice! Especially if you are using a different color optical drive. 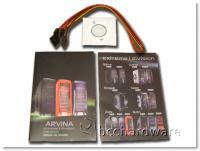 The Arvina has a total of 5 x 5.25 optical drives. The whole front of the Arvina has filter foam behind the steel mess except for the top 2 optical drive bays. 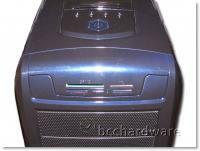 The front is easily removed to expose the front intake filters and optical drive bays. The right side panel of the Arvina is flat except for the security latch and is all black. The left side panel is also black, but it does have a raised area that is blue which is where the side intake is located. The bottom of the Arvina has 6 rubber feet for it to rest on and also has a wire mesh covering all of the openings. 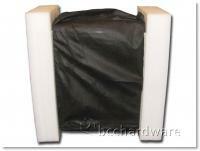 It also has an area to mount an additional 120 or 140mm intake fan if you require it. The rear of the Arvina has openings for motherboard input/output panel, 7 expansion slots, 2 apertures for water cooling, a 120mm exhaust fan and a opening for the bottom mounted power supply.